Sketches of Canada for February 28th! The 2010 Winter Olympic games were held in Vancouver, British Columbia. 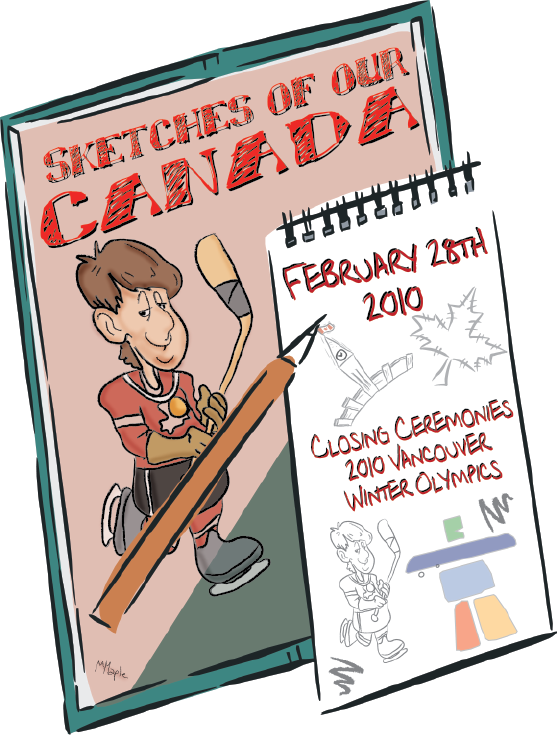 This Canadian History for Kids, Sketches of our Canada, looks at this remarkable event and the closing ceremonies. Canada previously hosted the 1976 Summer Olympics in Montreal and the 1988 Winter Olympics in Calgary. Canada participated in all 15 sports and sent a team of 206 athletes (116 men, 90 women). Canada failed to win a gold medal in Montreal and Calgary, but in Vancouver, Canada won its first gold medal on home soil and broke several Olympic medal records that are listed below for this Canadian History for Kids article. On February 14, freestyle skier Alexandre Bilodeau became the first Canadian to win a gold medal at home. He won it in the mogul skiing competition. Canada finished the 2010 Olympics with the record for most gold medals at a single Winter Olympics, with 14, one more than the previous record of 13 set by ­Soviet Union in 1976 and Norway in 2002. In 2010, Brian McKeever became the first Canadian athlete to be named to both Paralympics and Olympic teams, although he did not compete in the Olympic Games. The event was officially opened by Governor General Michelle Jean, who was accompanied by Prime Minister Stephen Harper and International Olympic Committee president Jacques Rogge. Canada’s total medal count for event was 14 gold, 7 silver and 5 bronze medals for a total of 26, our best Winter Olympics ever. Celebrity torchbearers included Arnold Schwarzenegger, Steve Nash, Matt Lauer, Justin Morneau, Michael Bublé, Bob Costas, Shania Twain, and hockey greats including Sidney Crosby and Wayne Gretzky. The Closing Ceremony of the 2010 Winter Olympics took place on February 28, 2010, at BC Place Stadium in Vancouver and it was the first Olympic Closing Ceremony held in an indoor venue since the 1984 Winter Olympics in Sarajevo.